Colour theory is one of the principal foundations of everything that the makeup artist does. Successfully recognising and matching a client’s skin tone and underlying tones, good corrective and camouflage makeup, enhancing or complementing natural colouring, blending in prosthetic pieces and creating realistic casualty effects – it all relies on colour as much as technique. Here’s our guide to colour theory for makeup artists. Red Yellow Blue (RYB) model – the colour system traditionally used in art. It has been around for centuries and is the model often taught in school; however, more recent experimentation has shown that the true primary colours are magenta, yellow and cyan. Magenta Cyan Yellow model – a more modern approach to painting and is the model used by printers. These colours mix a bright and clean spectrum. You can mix red, green and blue from these primaries too. We are using the RYB model, simply as it’s the one most people are familiar with, and it is easy to use for makeup and hair purposes. Knowing how to achieve a particular colour and understanding what colours cancel each other out are essential in makeup and hairdressing. The colour wheel is a simple way to look at the fundamental principal of mixing colours. Red, yellow and blue are the three colours from which other colours can be produced. When two or three primaries are mixed equally, they produce a dark grey. When two or all three primary colours are mixed in varying proportions, they make different browns. The secondary colours of orange, green and violet are made by mixing equal amounts of two primary colours. So, a 50:50 mix of the primary colours yellow and blue makes the secondary colour of green. Vermilion, amber, chartreuse, aquamarine, indigo, and violet-red are made by mixing one primary colour equally with one of its adjacent secondary colours. So a 50:50 mix of red (primary) + orange (secondary to red) = vermilion. Unlike primary and secondary colours whose names are established, the description for tertiary colours can vary, but we’ve used familiar names in our colour diagram. Each colour has a complementary colour and this is the opposite colour on the colour wheel (e.g. blue and orange). When placed next to each other they create a strong contrast. When mixed in equal proportions, they cancel each other out producing grey. Complementary colours can be used in makeup for colour correction e.g. red areas on the skin can be “calmed down” with a touch of green (though use too much and the result will be too dull and greying). Bluish dark circles can be countered with an orange-based concealer. In hairdressing, complementary colours are used to neutralise tones e.g. purple shampoo can be used to knock out brassy yellow from blonde hair, or a blue toner to neutralise orange tones. Colours that share one base pigment are called harmonising colours and they blend easily into each other. 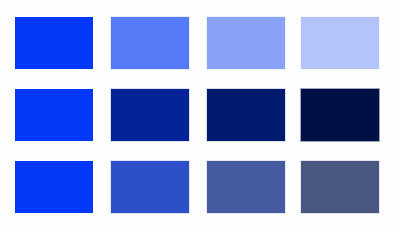 For example: blue, indigo and violet are harmonised, as they all share blue in their colour. Likewise, green, chartreuse and yellow are harmonised, as they all share yellow. The colour spectrum is a continuous thing – colours move seamlessly from one into another without hard borders. Mixing colours in differing proportions allows us to create any colour we want, except black or white. For makeup purposes, by understanding how colours mix or work together, we can match any foundation to any skin tone, conceal correctly and achieve the desired finished result. Browns are made by mixing two or three primary colours, or two or three secondary colours in various proportions. Grey is created when two complementary colours are mixed in equal proportion. Citrine brown (orange + green) has a yellow bias and is referred to as sallow or golden. But wait! There’s more to colours than simply getting the mix right. How a makeup ends up looking on camera is affected by many other factors. To further understand, we look at some of the properties that every colour has and, in a bit, how colour is perceived. Colour can be described using various properties including hue, tint, shade, tone, brightness and saturation. Describing Colour – this chart shows how tints (top line), shades (middle line) and tones (bottom line) graduate and differ from the same hue of blue. Adding white to the blue (the tints) produces soft pastel colours, and adding black (the shades) produces stronger blue colours. 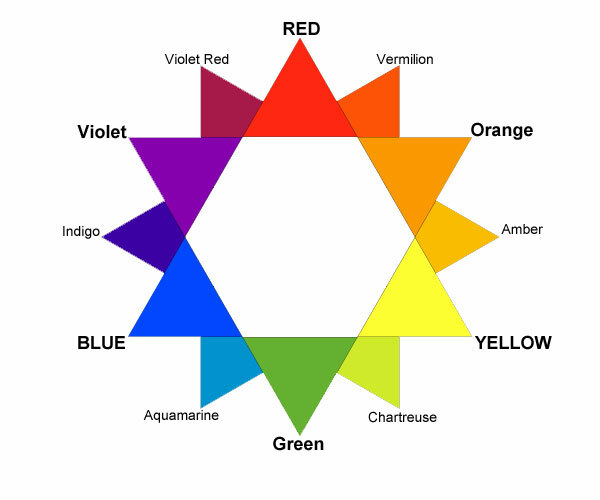 Hue is the pure basic colour group as seen on the colour wheel: red, yellow, green, orange, blue and violet. It’s a colour without the addition of black or white. Tint = hue + white. Adding white to a hue makes the colour lighter and soft, creating pastels like apricot, peach, opal, lilac and cream. Shade = hue + black. Adding black makes the colour darker and creates colours like navy blue and royal purple. 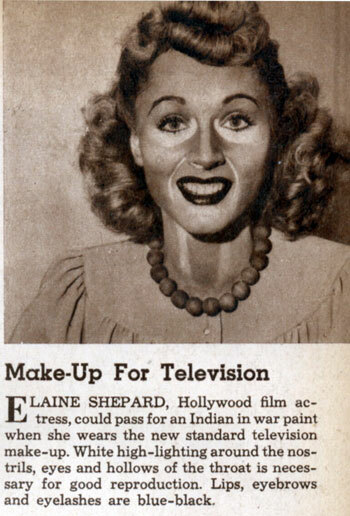 An extreme example perhaps, but this shows how makeup was done for old black and white formats – the tone of the makeup was considered, rather than the actual colour. Tone = hue + grey. Tone is basically how light or dark a colour is and “tonality” refers to the lightness or darkness of a colour. Adding grey to a colour creates a graduation in tone. This is particularly important in black and white photography, as you see tones rather than colour. For example, a light orange and a light blue could have the same tonality and, therefore, would look the same on black and white film. Makeup for black and white photography is different to working in colour formats – you have to understand how a colour will look in black and white. For example, a red cheek colour would look darker than the foundation, so you wouldn’t apply it to the apple of the cheek, as this would create a darker patch. You would apply blush under the cheek to create a shadow and to define. You could actually do a makeup for black and white using any colours, so long as you understand the tonality of the colours you are using, it will work just fine! Brightness basically refers to the amount of light that is reflected off the colour. Brightness is also referred to as value and is essentially describing how light or dark the colour is perceived. For example, yellow is brighter than a dark blue, and pink is brighter than dark red. Yellow and pink can be said to be higher in value than the darker colours, which are lower in value. Saturation tells us how “colourful” a colour looks under certain lighting conditions. It is how intense the colour is perceived. For example, take any makeup look – when viewed in daylight it will look different from when viewed at night. The makeup is the same, the colours haven’t actually changed, but the saturation has, giving us a different perception of the colours. The more a colour is saturated, the more vivid the hue. A washed out (or greyed) colour could be said to be desaturated. Visual perception is our ability to interpret information and surroundings from the effects of visible light reaching our eyes. The resulting perception is also known as eyesight, sight or vision. When looking at an object, the colour we actually see depends on the colour of the light source, the colour of any filters used and the colour of the object that reflects the light. This is why using coloured gels or filters on cameras and studio lights changes the way skin tone, hair colour, costumes and the set can look. Colour is also susceptible to its surroundings – meaning that our perception of a colour is not fixed, it is constantly changing as things like the light source and our environment change. Which bit are you drawn to first? Simple example to try and show how brightness gets our attention first. A colour’s properties also determine how we perceive that colour. Some colours register more quickly with us – that is, we notice them first – and some colours can make things seem closer, or give depth. Warm colours: colours that “reach the eye” first are considered warm colours. They advance towards the eye and appear to stand out more. Generally colours containing red or yellow are considered warm. That’s why red is used for warning signs – the red stands out and we notice it more quickly than say a dark blue. Higher in value: colours that are high in value (i.e. brighter) advance towards the eye and are perceived more quickly than colours that are low in value (i.e. darker), as they seem to recede and are perceived by the eye less quickly. So a bright red would be perceived quicker by our eyes and stand out more than a darker red. This is why light colours are used to highlight, as they make those areas stand out more. Cool colours: cool colours such as blue, purple and green meet the eye more slowly than warm colours and are said to be receding. Low in value: when a colour is darker, they are considered low in value (they are less bright) and seem to recede from the eye. This is why darker colours are used to contour, as they create depth. What Affects How Makeup Looks on Screen? The amount of lighting used: the brighter the light source, the more faded or washed out a colour and makeup will appear (just like in the midday sun). The type of lighting used: a big light will create a different effect to a small intense spotlight, and the type of bulb(s) in the light affects how hard the light can be. The direction of lighting: think about how different a face and its contours look if a light is under the person’s face, behind the head, above or to the side. Different shadows, highlights and contours will be created. The use of coloured gels on lights and filters on the camera lens. Some filters add warmth, some are cold, some are neutral. Get to know what colours soften features and skin tones, or add a cold tone. Also, adding a coloured gel or filter can totally change the colour of how the makeup looks or make it “disappear” all together. The colour and reflective value of sets: for example, if someone is chopping limes on a green board, the light may bounce off this and reflect under the person’s face, giving them a slightly green hue. It is always imperative to look at a makeup through the lens of the camera or on the stage to view the actor in the environment they will actually be in. What you did in the makeup room may not be what is seen on camera or how it is perceived on stage and adjustments to account for the environment may need to be made. Minor tweaks are part of the job, and camera tests and dress rehearsals are great for some tweak time to get things looking just so. Sometimes, however, you don’t get the luxury of tests so the more you understand colour and all the factors involved, along with general experience, the better. We use colour theory in makeup to obtain the colours we need and to create effects – in essence, we trick the eye. Contouring, for example, uses this basic principal of colour perception to create highlighting and shading. To create depth under the cheekbones or in the eye socket, we use a darker or cooler colour. To create a highlight on the cheekbones, a brighter/lighter colour is used, creating the illusion that the cheekbones have been “pushed out”. To highlight or draw attention to a feature, we use colours that are high in value (brighter) and/or warm. To create depth and shadow, we use darker colours. 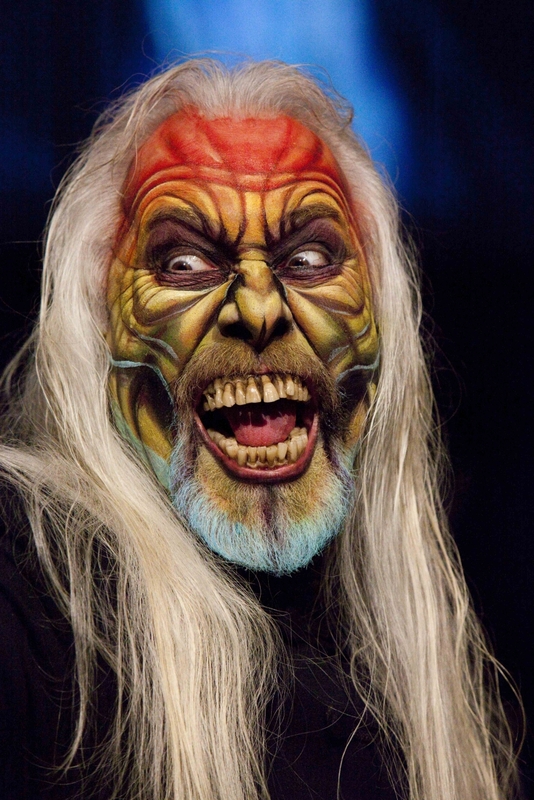 Rick Baker’s makeup here is done using just cake makeup. We were lucky enough to have witnessed this splendid transformation, and all he used was a couple of products from MAC, a brush or two and his fingers! Look at the amazing contours, depth and altered facial dimensions achieved purely by using basic colour theory (oh, and amazing artist ability may have helped!). We also use colour theory in makeup to match makeup to someone’s tones, mix foundations and concealer to get the perfect match, to change the tone of eye shadows and lip colours to get the exact colour we want should it not be in the palette – and many other things. A good makeup artist probably has a naturally “good eye for colour” (and was simply born with this ability), but by really knowing your colour theory, you will be able to do many things. The best way to put all this colour theory for makeup into practice is to experiment with your own makeup products. Mix eye shadows to create new shades or colours, try making a warm colour cooler or add warmth to a cool colour, tone down the green, zing up the red… the possibilities, dear reader, are endless. Go play! Thank you for this very comprehensive article on color theory for the makeup artist. This rocks!! !